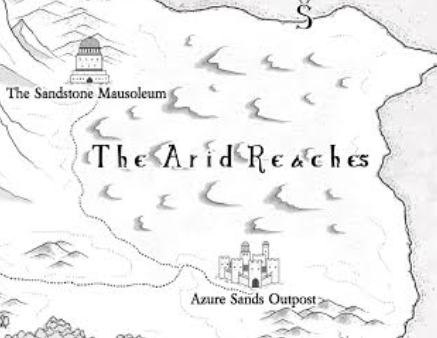 The other highlight is a location where nearly half of Book 2 takes place–the Arid Reaches. Our heroes converge onto the forlorn desert in a search for the sacred vessel of magic known as the Radia of Hope, but they’re bound to also find many bloody secrets that will forever change their perspectives on the kingdom of Tordale. Elisstriss hurried over the sandstone hills with Ausmus and the rest of the Aesur soldiers ringed about her. She glanced over her shoulder once or twice while they ran; night had fallen over the desert, making it difficult to make out most shapes beyond what was near her, but she could see several torches burning through the darkness. They were still being pursued. Three days earlier, Elisstriss had detected a distant, but immense outpouring of magic. Even though she had only experienced the powers of Airtamers in her life, she knew that what she sensed was the empyreal essence of a Spiritcaster. Believing that it could lead them to a valuable ally, who could possibly provide answers on the state of the surface world, Elisstriss guided her team of Aesur soldiers through the Tower Mountains into the region where the far-off source of magic seemed to originate from—the Arid Reaches. They had traversed much of the Tower Mountains fairly quickly. With the many air currents that flowed throughout the twisting maze of rock spires, they were able to soar throughout the peaks, the plumage over their bodies acting as sails to carry them great distances in little time. When they came to the desert, however, their progress slowed dramatically. The barren wasteland did not offer the same air currents that could carry them for miles, and although Elisstriss had the ability to conjure winds of a similar nature, repeated efforts would drain her magic, and her life force, leaving she and her soldiers to spend nearly all their time in the desert marching by foot. But the distant magic that she followed urged them onward, particularly a day earlier, when she had sensed it, again. This time, she saw a vision of who summoned the magic. It came as a brief, vague image of another person, a human, as far as Elisstriss could tell. The person was a young woman, seemingly Elisstriss’s age. She was beautiful, with green eyes that shone like emeralds, and long, thick locks of hair that could just as well have been streams of amber. Her clothing told Elisstriss the most about her—regal attire that was adorned with a panther surrounded by four diamonds. Elisstriss had never seen this young woman before, but she had been told enough by Dayneth long ago to know that it was Princess Raissa Hokara who she perceived in the vision. However, she now feared that they may never even reach the human Princess. As night fell upon their third day marching through the desert, a great horde of bandits beset their group. They appeared swifter than the darkness that veiled the Arid Reaches, and in far greater numbers than what Elisstriss had in her party. They did not issue a warning or an announcement; they ambushed the Aesur without hesitance, ill-intentions painted over their malicious expressions. They were rough-looking men, dressed in dingy clothing and worn armor. Each one was outfitted by an array of swords, daggers, and other deadly weapons. Some guided themselves through the night with torches, while others used the gloom to conceal themselves before attempting to catch the Aesur off guard with a surprise attack. Ausmus and his soldiers expertly held off the first wave that threatened them. Despite being outnumbered nearly two-to-one, the Aesur proved that their years as Skyscape’s most elite soldiers had forged them into combatants that were far superior to the reckless bandits. The Aesur took to battle formations without delay, unifying their fighting strength and granting them the protection of their fellow soldiers at their side. Their spears and bladed-talons, used in tandem with their unequaled deftness, proved insurmountable to the bandits. The Aesur foiled the marauders’ attack before it seemed to even begin. But where the first wave of bandits failed, more took their place. It quickly became evident that a sheer horde of ruthless outlaws set their sights on Elisstriss’s party, surrounding the chain of rocky hills where they marched in the hopes of closing them off from escape. No matter how skilled the Aesur soldiers were, they could not face what nearly amounted to a small army. Ausmus led Elisstriss and the soldiers onward, making sure that they hurried as quickly as possible while shielding the Highfeather’s youngest daughter from any danger. On occasion during their retreat, a handful of bandits leapt out of the darkness at them. The bandits’ rarely posed a grave threat, being easily dealt with by the Aesur just like the other assailants. But as their attacks continued, Elisstriss realized that her party’s advance slowed, allowing the greater portion of the bandit horde to close in on them. The Aesur eventually came to the rise of a particularly large hill that overlooked the rest of the chain, granting them a broad view of the desert beyond. As they neared the crest, Elisstriss spotted that several bandits had already gotten there, and more were hurrying to join them. She pushed her way to the front of the Aesur soldiers and began to silently call to her innate magic, readying a mighty spell that would capture the bandits in a furious wind. She never had the chance to unleash it, though. Just before she could, Ausmus and a few other soldiers dashed ahead of her and met with the bandits, themselves. Ausmus, alone, felled half of the ruthless men. His bladed talons struck them down with flurries that the bandits were helpless to defend against. The other Aesur soldiers disposed of the remaining bandits with little trouble, their spears and bladed talons soon clearing the hill of any foe. At a different time, Elisstriss may have been in awe of the soldiers’ prowess in battle, but she was frustrated that they threw themselves into danger when she could have handled it, herself. Elisstriss knew exactly what he meant. She could settle her dispute with him later. Without a word, she began to summon her Airtaming ability, once more. Having already called to it before, it did not take very long before she was able to gather the necessary magic that she required for what she intended. When she felt her magic peak, she directed it out of her physical form, sending it into the very air around the Aesur. As her magic and the air converged, she bent the desert air to her will, crafting it into a tremendous rush of wind that roared over the hills like a hurricane. She and her fellow Aesur caught the monstrous gale with the plumage over their limbs. The desert floor dropped away from them, and they were lifted high into the night sky. Even as Elisstriss ceased her spell, the gale roared across the desert like a tidal wave from the most furious ocean, carrying the Aesur far away from their pursuers. Soon, Elisstriss could not spot the bandits’ torches burning in the night.